The 51st annual Booleroo Steam & Traction Rally is back again on the 31st of March! This year's feature will be stationary engines. The rally kicks off with the swap meet, followed by the rally itself. Gates open for early birds at 7.30 am. 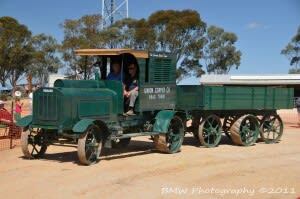 The annual rally is where members of the society get to share their knowledge and showcase the fabulous machines that form an integral part of our Australian heritage. The working display of priceless machines allows the public to see machines perform the work they were originally built to do. The most unusual and unique display is dam sinking or scooping, using two 1880s, 26-ton Fowler steam ploughing engines, one at each end of ‘the dam’ site, with the scoop being hauled from one end to the other in turn by wire rope and winch. The highlight of the Rally day is the Grand Parade, just as at any other agricultural function, only here the oval is full of machines, not livestock.